I will work on some more fixes later today and tomorrow. Thanks for testing guys! (2015-08-17, 23:13)Hitcher Wrote: Anyway this could extended to separate hours and minutes? (2015-08-17, 23:32)ronie Wrote: a friendly request: you should really prefix all the window properties you set with the name of the addon. (2015-08-18, 09:34)tomer953 Wrote: Now I choose "Choose shortcut" or "choose widget" and I see "Smart shortcut" - but they both empty. See the readme... you have to enable the smart shortcuts by setting some skin Bools in your skin to true. (2015-08-18, 09:34)tomer953 Wrote: currently I use script.skin.info.service by Phil for some thing I will glad to see in your script instead. (2015-08-18, 09:34)tomer953 Wrote: 4. As I requested before, to create "smart background browser" that I can use from skinshortcuts, for exmaple, being able to add menu "youtube" add assign to it the Fanart from the addon as a background. Use the smart shortcuts feature for that... I will see if I can add the YouTube addon too but I'm not sure if that even provides fanart ? (2015-08-18, 09:34)tomer953 Wrote: 5. as I write this, I get scripts error from the script, and also from extendedinfo which says invalid ID and more stuff, ill post maybe unicode errors, or the fact i'm using mysql server... ill check it out later. Yep, unicode errors... I did'n't really test that. Glad you did ;-) Thanks. I fixed the ones you reported on Git. just a tiny guide if possible, how do I enable the option to assign widget from favourite list? (2015-08-18, 22:44)tomer953 Wrote: many thanks...amazing work. 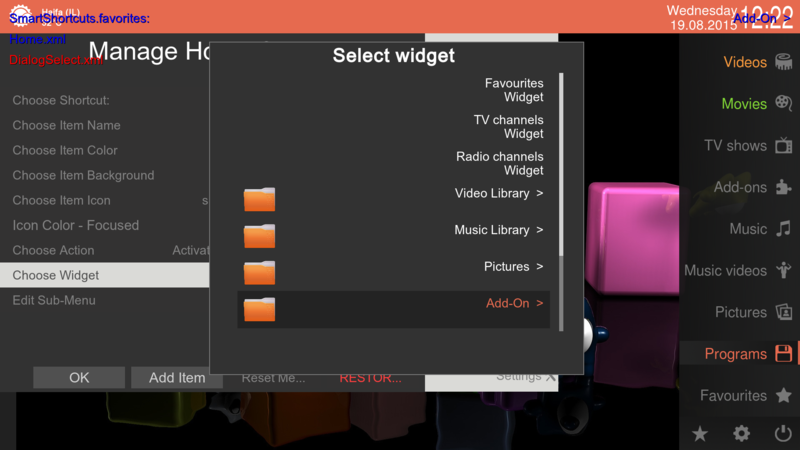 Do you want a widget which lists the favourites or do you want to create widgets for the items in your favourites ? I want (as users requests) to add things to favs, then assign their path as a widget. Then in the widget selector, i want option to choose that, and to use the path of it as content. 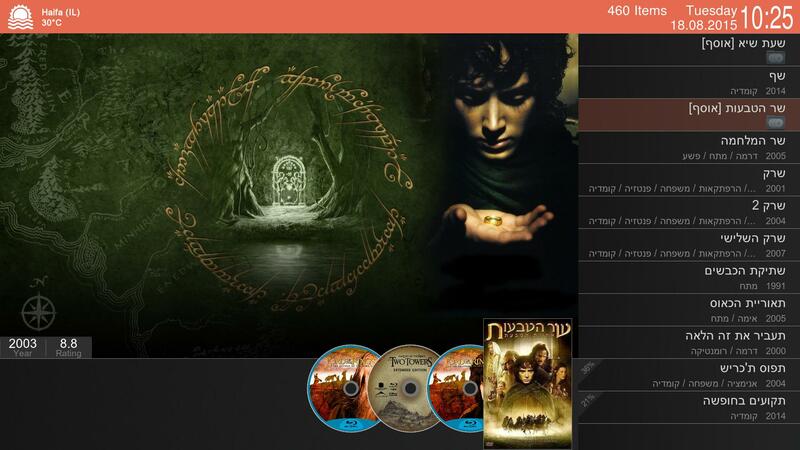 So the widget will fill with music videos from youtube. I request that because users got used to work this way in my old way, as I mentioned before, I used with JustSelect method, and there, you included favs folder. All I want is to add this folder to the widget selector. Ah right, now I see. Well in that case enable smart shortcuts for favorites, it does exactly that. I think you can do it in a tiny update in the skinshortcuts addon, and not here..or i'm missing again the way I should make it work. that one caused your script to actually activate it, and when I tried to choose widget, It started to play music in the background one after one.. So as you can see, trying to filter those, and make some "smart way" to show them, it making thigns hard, could you just add "favourite" folder to let the user choose from? whatever is there to appear, users should know what they choosing. Hi Marcel, that's an amazing list of features, Thanks. Gave it a shot to the colorpicker, definitely will use this as it offers improvements and easy to include in my code. Just 1 suggestion is that it could be even more user friendly if colors were ordered by color base. Mixed colors are not easy to choose. Not sure if it's possible. I've seen that you have a Youtube trailer search, so I have something in mind that could be a request. I'm trying to get a thumbnail on the fly for live tv programs and I noticed the first youtube image preview is almost 100% relevant to the ListItem.Title. Do you think it should be possible to get something like this to work ? 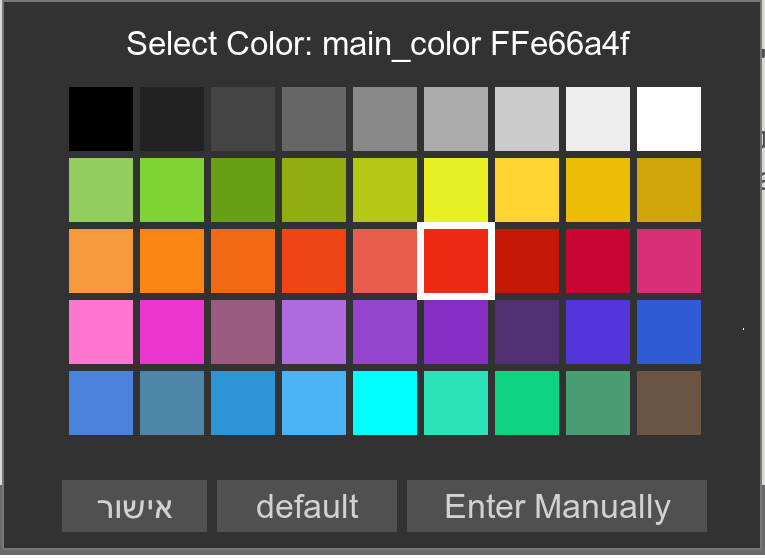 (2015-08-19, 12:47)Jayz2K Wrote: Gave it a shot to the colorpicker, definitely will use this as it offers improvements and easy to include in my code. If skinning engine will have option to colordiffuse a thumb, I will try to build that myself. (2015-08-19, 11:51)tomer953 Wrote: So as you can see, trying to filter those, and make some "smart way" to show them, it making thigns hard, could you just add "favourite" folder to let the user choose from? whatever is there to appear, users should know what they choosing.